Универсальный медиа-проигрыватель Blu-ray, DVD дисков, музыки и т.д. 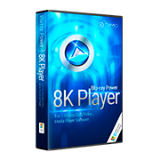 Dimo 8K Player 4.2 был доступен бесплатно 5 августа 2018 г.
Многофункциональный проигрыватель, позволяющий воспроизводить Blu-ray диски, Blu-ray папки, ISO файлы Blu-ray, DVD, а также стандартные SD/HD и H.265/HEVC видео. Создание анимированных GIF изображений быстрее, чем за 30 секунд. Зацикливание целой видеозаписи или отрезка видео при просмотре фильма. Запись происходящего на экране в формате видео. Добавление закладок в видео для последующего просмотра. Медиа-проигрыватель, который позволяет воспроизводить не только Blu-ray фильмы, но и DVD, SD/HD/4K UHD видео и музыку, сохраняя высокое качество. Ссылка на получение ключа указанна в readme. https://www.mediadimo.com/free-video-player Там даём свой Email и жмём: Get License Code. Откроется окно с Registration Code (ключ мелким шрифтом) и там же можно скачать саму программу, хотя она уже есть в скачанном архиве. При первом запуске установленной программы она сама запросит ключ. Скажите пожалуйста, куда вставлять лицензионный ключ для активации программы? при первом запуске выскочит окошко, куда и надо вставить ключ. Элементарно, Ватсон! Юрий, при первом запуске выскочит окошко, куда и надо вставить ключ. Элементарно, Ватсон! Thank you, it I will pass on this one as I don’t see any content coming in 8K for quite a few years yet.. It is hard enough to acquire legally, 4K HDR content on the PC, let alone 8K.... Where would one acquire 8K? And how would one play 8K when all the sets are still only available in 4K? This is for the PC, not the Mac... Thank you, it I will pass on this one as I don’t see any content coming in 8K for quite a few years yet.. Although this developer's pioneering work in 8K technology has hitherto escaped my attention, it's evidently a fact that the Dimo 8K Player has considerably evolved from version 1.0 to 4.2. As such, it's absolutely ideal software for all those with an $11,500 (at time of writing) 8-foot wide desktop monitor connected to a PC incorporating Super Hi-Vision hardware for the management of 7680x4320 resolution video that for some unfathomable reason seems not to be available to me from any distributor or stockist that I know of. I can only conclude that today's giveaway is aimed at GOTDers more fortunate than me in that they already have $30,000 televisions in the extensions they have purpose-built to their existing homes and through which they view 8K programming as well as their own 8K video collections. On which basis, I'll leave it to them to post their own Dimo 8K Player 4.2 reviews, all of which, I promise, will be read with considerable interest. Thanks then, Dimo and GOTD, but I'm sadly unable to take advantage of today's generosity. Although this developer's pioneering work in 8K technology has hitherto escaped my attention, it's evidently a fact that the Dimo 8K Player has considerably evolved from version 1.0 to 4.2. As such, it's absolutely ideal software for all those with an $11,500 (at time of writing) 8-foot wide desktop monitor connected to a PC incorporating Super Hi-Vision hardware for the management of 7680x4320 resolution video that for some unfathomable reason seems not to be available to me from any distributor or stockist that I know of. I can only conclude that today's giveaway is aimed at GOTDers more fortunate than me in that they already have $30,000 televisions in the extensions they have purpose-built to their existing homes and through which they view 8K programming as well as their own 8K video collections. On which basis, I'll leave it to them to post their own Dimo 8K Player 4.2 reviews, all of which, I promise, will be read with considerable interest. Thanks then, Dimo and GOTD, but I'm sadly unable to take advantage of today's generosity. All software from Dimo eventually tells me that my license has been banned after one or two months. Don't know why. Wrote to them and they did not understand. Amazing lack of controllability in this program. Once placed into full screen, only Task Manager can get it out and turn it off. There is no area to input the registration code. The control, while still available is very simplistic. This may play all colors of the rainbow, but its useability is beige. Uninstalled and all reference to it removed from computer. Too buggy, it did play a Blu-ray disc, but not from the beginning, after I minimized it and maximized it again the video disappeared only the sound played, so I closed the program, but it did not close, the sound kept playing! I had to restart the PC to stop it because it was not even in the task manager. Confusing interface.